There's been no post on the blog for 17 days on account of my being away. I was able to do a round trip visiting our people in Sydney, Christchurch (New Zealand) and Auckland (New Zealand). The TAC Parish in Sydney is "St Mary the Virgin", and they meet in the chapel of the Lady Davidson Private Hospital, Bobbin Head Road, North Turramurra. The chapel is set in the beautiful bushland for which that part of Sydney is well-known. The Parish priest of St Mary's is Father Warren Wade (pictured left), a man with long experience as a Bush Brother, and then in working with young people who had gone astray. 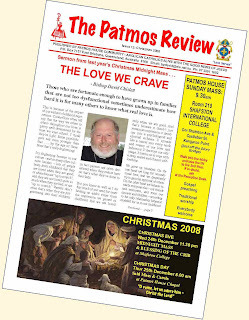 Like many truly dedicated TAC priests of the "old school" he is using his retirement to continue his ministry. In fact, he has his own radio program, which is, in its own way, a vital outreach on the central coast. It was great to celebrate Mass and preach for our brothers and sisters at St Mary's who were, of course, keeping their patronal festival, the Solemnity of the Assumption. We considered Mary as the "firstfruits of redeeming love." We thought of her not just as the Mother of all her Son's people, but also as our Sister in Christ whose experience of God's grace, openness to the Holy Spirit and response to the Word - at each point of her pilgrimage helps us to understand God's way with us as we, too, journey toward heaven's glory, supported by Mary's love and prayers. This turned out to be something of an ecumenical occasion, as people from Roman Catholic and Protestant churches in the surrounding area came to support us. The Mass was followed by a parish lunch. The next day, those at the core of parish life returned for a discussion of future directions and ways of facing up to the challenge of evangelism and outreach so as to draw new people to the Lord. 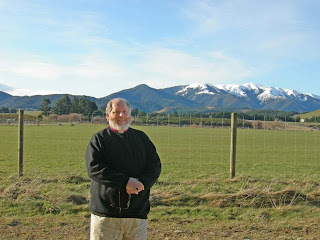 I then flew to Christchurch and was met by Ed Bakker who was ordained to the Diaconate in February this year. Deacon Ed and his wife Liz are just out of Christchurch in the small town of Oxford, not far from the foothills of the Southern Alps. There has been plenty of snow this year as you can see in this photo (which proves I was there!). 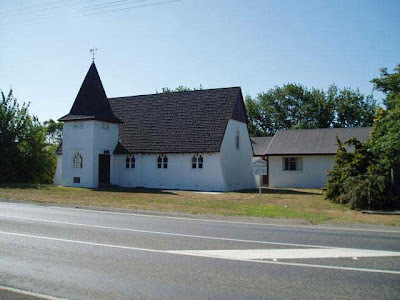 Readers will understand that although the "official" Anglican Church in New Zealand has had women priests for thirty years, a new situation has developed in the Diocese of Christchurch with the appointment of a woman bishop. 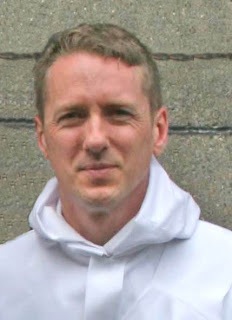 A small number of Anglicans who see the "ordination" of women not just as a "difference of opinion on a second-order issue" but as a rupture of sacramental grace and inconsistent with the teaching of historic Anglican formularies which commit us to Catholic faith and practice, are considering their options. 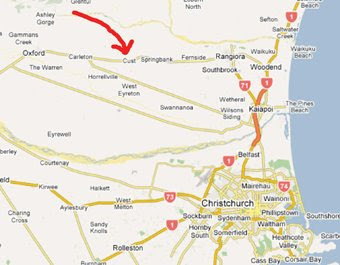 Under these circumstances it is fortuitous that we have a small but growing presence in that part of New Zealand. Deacon Ed (pictured left) has just obtained the use of a church at Cust, halfway between Oxford and Rangiora, where he will conduct fortnightly services on Sunday afternoons, and - when he has been ordained to the priesthood - celebrate Mass. This church is part of the Oxford Union Parish with whom we have good ecumenical relations. From Christchurch I flew to Auckland to visit our congregation who are under the patronage of St Hilda and St Sebastian. Their priest is Canon Ian Woodman, and they, too, have a new deacon, Andrew Wooding (pictured right). It is always good to catch up with Father Ian, a fine Catholic evangelist who reaches out in all sorts of ways to a wide range of people. We had an adult Confirmation during Mass on Sunday, as well as a meeting to think about growth, development and outreach in years to come. 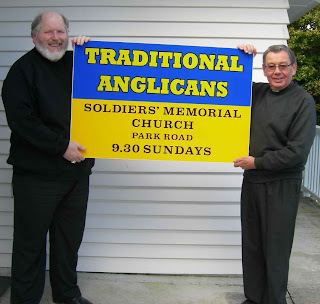 Below I and Fr Ian are holding up the new sign for the main road just near the church building. May the Lord continue to pour out his blessings on our people in Sydney and New Zealand! What a great set of readings we had at Mass today! There was poor old Elijah being restored and healed on the inside, finding God, not in the earthquake, the wind or the fire . 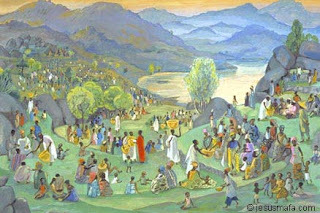 . . but in the "still, small voice" (1 Kings 19:9,11-13). The Gospel Reading (Matthew 14:22-33) began with Jesus, too, taking "time out" for prayer with his Father. It then continued with the well-known account of his walking on the water. 1. The disciples were in a situation conducive to fear. The danger was real. They were "beaten by the waves; for the wind was against them" (v.24) We thought about how that is so often the condition of our lives - as individuals, and also sometimes as a church community. 4. Peter was O.K. for as long as he kept his eyes fixed on Jesus. But, he did what we all do. He took his eyes off Jesus and "saw saw the wind." In other words his focus shifted from Jesus to the storm, the circumstances of his life that were beyond his control. He became afraid - maybe even questioning the reality of what he was doing - and began to sink. We all know what that feels like! 4. Jesus rescued Peter. He did say "O man of little faith,why did you doubt?" (v.31) From our vantage point we sometimes look down on Peter and concentrate on his failure. But his "little faith" was more than that of those who were still in the boat. Maybe they were "safe", but it was Peter who took the risk to get closer to Jesus. There is always an element of risk when we respond to the Word in a new way. Today's Gospel shows that if and when we fail, the Lord will rescue us. Failing and being rescued by Jesus is much better than not having responded to his Word in the first place! 5. When Jesus and Peter reached the boat together (in my imagination I see them now dancing for joy on the water rather than just walking!) the others in the boat "worshipped him, saying, 'Truly you are the Son of God.'" (v.33). A moment of revelation for the onlookers. What that says to me is that our continued response to the Word, and our preparedness to take the "risks of faith" God puts before us, is an important part of our witness to others. If more us us responded to the Lord as Peter did, it is likely that those around us would - like the men in the boat - come to a fresh realization of who Jesus really is! And hence also is that which was just now read, “Lord, if it be Thou, bid me come unto Thee on the water.” Matt. xiv. 28. For I cannot do this in myself, but in Thee. He acknowledged what he had of himself, and what of Him, by whose will he believed that he could do that, which no human weakness could do. Therefore, “if it be Thou, bid me;” because when thou biddest, it will be done. What I cannot do by taking it upon myself, Thou canst do by bidding me. The entire sermon is HERE. 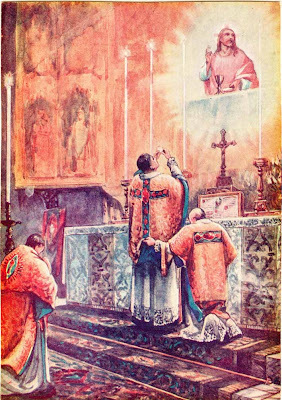 What an important set of readings we have for today's Mass. [Isaiah 55:1-3; Romans 8:35,37-39, Matthew 14:13-21] They assure us that the Lord loves us, that NOTHING can separate us from that love, and that he feeds us, sustains us, nourishes us and refreshes us . . . not JUST so that we are strong enough for the journey to heaven, but also that we might celebrate his abundant blessings here and now. "All the while they were fighting for a few drops of moisture, they had actually been floating on potable water! You see, they were near the Amazon River - a river so huge that it pushes fresh water far out into the ocean. ( *'The quantity of water released by the Amazon to the Atlantic Ocean is enormous: up to 300,000 m³ per second in the rainy season. The Amazon is responsible for a fifth of the total volume of fresh water entering the oceans worldwide. Offshore of the mouth of the Amazon, potable water can be drawn from the ocean while still out of sight of the coastline.') The men could have dipped a bucket off the side of their boat and drawn out drinkable water. "Speaking to the young people, Pope Benedict identified the things we are thirsting for: love that endures, opportunity to share gifts, unity based on truth, communion that respects the freedom of the other person. You can sum this up by saying that we long for three things: goodness, beauty and truth. But, said the Holy Father, instead of goodness, beauty and truth what our society offers is choice, novelty and subjective experience. Those things are not bad in themselves, but to stop there is like squeezing water out of canvas when we are floating on an immensity of drinkable water. "And what is that ocean of living water? The pope answers in a single word: Jesus. Only by Jesus and his Holy Spirit will we find the goodness, beauty and truth we desire. Only he can give love that endures, freedom that respects each person. "Come to the water. God wants to give a gift that will satisfy us, a gift that will change us. By way of conclusion, I would like to quote Pope Benedict's invitation to young people: "God's love can only unleash its power when he is allowed to change us from within. We have to let it to break through the hard crust of our indifference...our blind conformity to the spirit of this age. Only then can we let it ignite our imagination and shape our deepest desires." Come to Jesus. Come to the water." 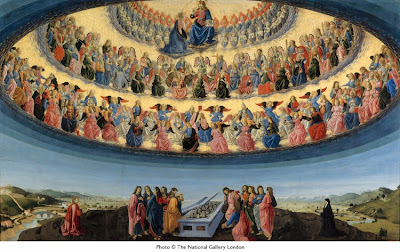 Having checked out this blog, Father David Marriott from the Anglican Catholic Church in Vancouver, Canada, was kind enough to send me his sermon of a couple of weeks ago on St Mary Magdalene. It is so good that I have posted it HERE for you to read. Thank you, Fr Marriott!